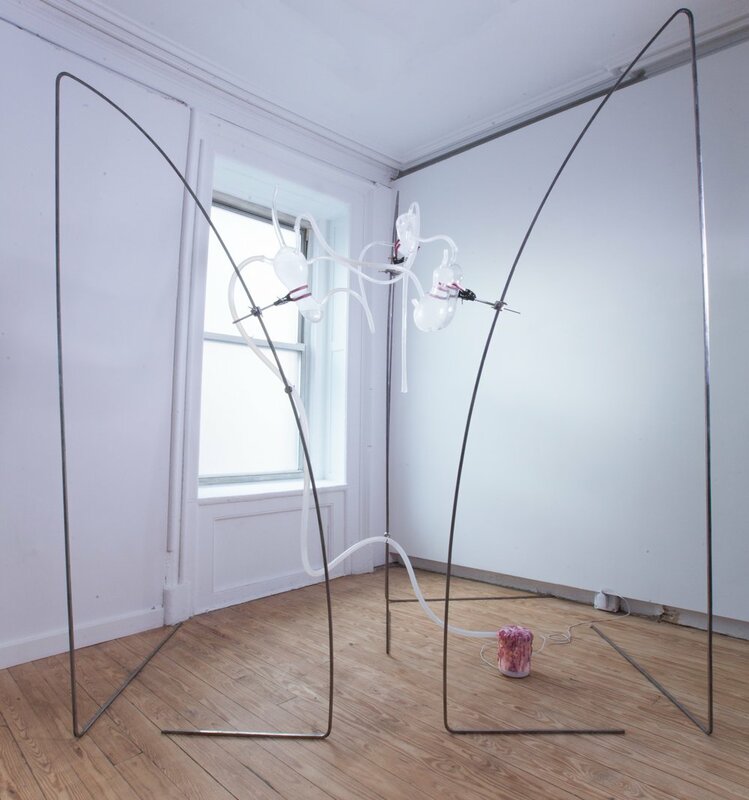 Helena Anrather is pleased to present A WET CHEMICAL TRACE, an exhibition of new work by MIT-based artist Miriam Simun. Comprised of a series of sculptures that infuse the gallery with the scent of the Agalinis acuta flower, as well as a ten-minute video work, the exhibition will be on view from September 6th through October 21st, 2017. On view in the gallery is a series of bent-steel sculptures, presented in pairs, which Simun built as a kind of digital, or post-natural garden. Simun bent the forms herself, using her body and cold-bending techniques to curve eight lengths of steel rod into lyrical armatures. 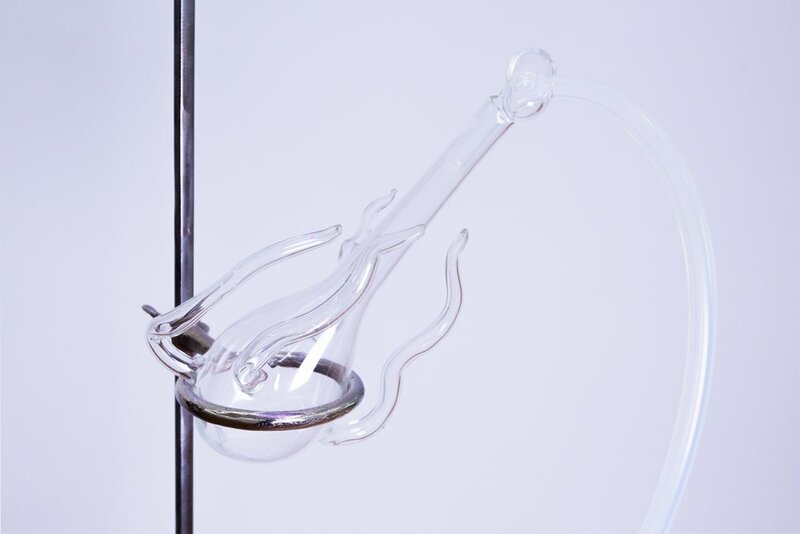 The steel forms are affixed with grow lamps, oddly shaped glass flasks, and a range of equipment familiar from research laboratories, but none of the sculptures is fixed in a permanent state; just as equipment might be moved in a laboratory, Simun’s work suggests the possibility of rearrangement. In each of the sculptural pairs, one of the armatures is affixed with a grow bag that holds Schizachyrium scoparium, or little bluestem grass, the plant onto which the Agalinis acuta attaches its roots in order to gather nutrients. Black lights and grow lamps dipped in silicone are also affixed to these armatures, and directed at the grass to promote its growth. All other light sources in the gallery have been purposely extinguished: the gallery’s windows are tinted, and the overhead lights will be dark for the duration of the exhibition. The second sculptural element in each pair is affixed with a humidifier, the cistern of which contains a mixture of water and the digitally recreated scent of the Agalinis acuta. Through glass flasks and lengths of silicone tubing, the humidifiers emit heavily scented water vapor, to promote the growth of the bluestem grass and blanket the gallery with the scent of the flower. In this way, Simun’s sculptures invert the parasitic relationship that naturally exists between the Agalinis acuta and Schizachyrium scoparium: instead of seeping its nutrients from the roots of the grass, the Agalanis acuta-scented vapors support its growth. Also on view in the gallery is a ten-minute video work that Simun produced for the exhibition. 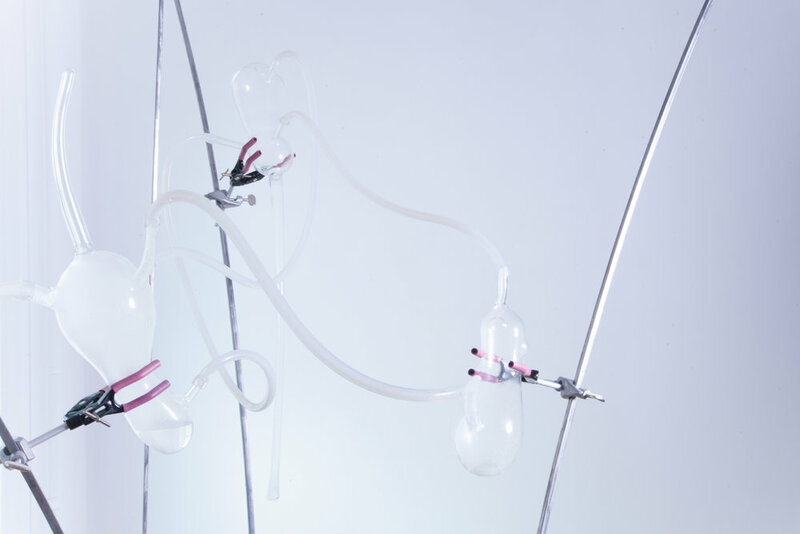 Presented behind a partition, with a projection suspended from silicone tubing, the video takes up the point of view of the scent of the Agalinis acuta. Assembled from a set of free-associative images and clips, the video makes reference to many of the visuals on view in the gallery, interspersed with clips of land shot from a low-flying plane, and the moment when Simun captured the scent of the Agalinis acuta with a team of chemists and perfumers from International Flavors & Fragrances Inc. (IFF.com). 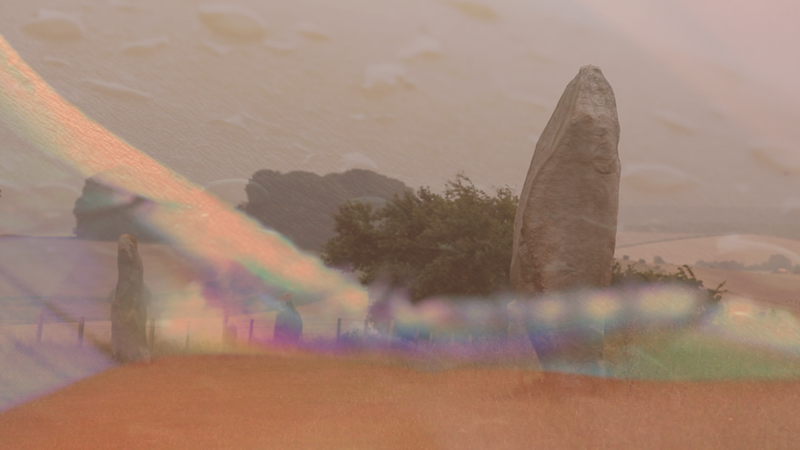 The video’s compositional strategy relies on a logic of layering, where different images rest on top of one another, with lines of text superimposed onto the imagery. Simun’s video imagines the scent with a sense of agency, working to question fundamental assumptions present in the natural sciences. Though scientific research typically posits human beings as separate from the aspects of nature they study, Simun’s video reflects on the way in which human scientific production might itself be part of nature, or the very biological processes which they study. A WET CHEMICAL TRACE is the result of Miriam Simun’s years-long inquiry into the history and biology of the Agalinis acuta, a hemiparasitic flowering plant native to coastal areas of the Northeastern United States. Agalinis acuta is on the verge of extinction, but the very fact of its existence is the result of a legal fiction that can be traced to a taxonomic imprecision. The species was granted endangered status in 1988, but in 2010, a pair of researchers determined that the Acuta is genetically identical to another species of Agalinis, the Agalinis decemloba. Despite the classificatory inaccuracy that led to the species’ existence, the acuta retains the legal benefits of its endangered status, but even among conservationists, the plant is not particularly well known. The acuta’s small pink blossoms, and the infrequency with which they bloom – one day per year, just after dawn – make the flower’s presence extraordinarily fleeting. Though the flower has a distinctive scent, its smell is imperceptible to the human nose, mostly because of the blossom’s size and ephemerality. Simun began working to reproduce the flower’s scent in 2014, and with the help of IFF’s headspace technology and senior perfumer, captured and synthetically reproduced the Agalinis acuta’s scent. In the years since, Simun has worked with botanists, chemists, ecologists, environmental theorists, and perfumers to create for the first time a comprehensive, interdisciplinary understanding of the plant. Miriam Simun (b. 1984, Palo Alto) lives and works at MIT, in Cambridge, Massachusetts. Simun is a graduate of the London School of Economics, the Interactive Telecommunications Program at New York University, and is currently a research assistant at the Media Lab at the Massachusetts Institute of Technology. Her work has been the subject of numerous international presentations, including exhibitions at the New Museum of Contemporary Art, New York; the Museum of Arts and Design, New York; the DeutscheBank Kunsthalle, Berlin; The Contemporary, Baltimore; Ronald Feldman Fine Arts, New York; the Museum of Fine Arts, Split; the Bemis Center for Contemporary Arts, Omaha; the Himalayas Museum, Shanghai; and the Beall Center for Art + Technology, Irvine. Simun is a recipient of awards from Creative Capital, the Robert Rauschenberg Foundation, the Joan Mitchell Foundation, and the Foundation for Contemporary Arts. She was the recipient of the Santa Fe Art Institute’s 2015 Food Justice Residency in New Mexico, and the OMI International Arts Center’s 2016 Artist Residency in New York. Simun’s work has received extensive coverage in media outlets both stateside and abroad, including the BBC, The New York Times, The New Yorker, CBC, MTV, Forbes, Art21, and ARTNews. A WET CHEMICAL TRACE is Simun’s first exhibition with HELENA ANRATHER.